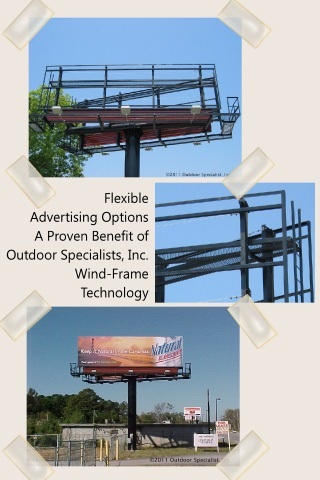 Wind Frame Technology For Billboards | Outdoor Specialist, Inc. In keeping with current technology and customer requests, OSI has developed and fabricated a wind-frame made of the same high quality structural steel that is used in our other state-of-the-art-structures. The wind-frame has been engineered and proven safe for use. The OSI wind-frame meets and exceeds customer expectations of a structural frame because it can house any vinyl sign message, while retaining the standard stringer system. Why would you want to retain the stringer system? Simple, the standard stringer system helps to maintain the integrity of the structure and its components, and is very versatile thus allowing for many different design options. Trivisions and message displays, for example, can be used with the stringer system allowing for ease of installation and upgrades that may be required at a later date. As with our other structures, the OSI wind-frame is designed to bolt together for easy installation. Simply unbolting the frame allows for easy removal should any changes or upgrades be required, while the standard stringer system remains in place. The wind frame can be stored and later remounted if necessary. OSI is dedicated to fabricating quality outdoor advertising structures. With a focus on the future, OSI seeks to develop and deploy technology that will improve the visibility, function, safety and ROI of outdoor advertising structures. OSI is proud to design, fabricate and install the highest quality billboards, signpoles and scoreboards that enhance the final product!